Fork tilt indicators allow for counterbalanced forklift operators to check if their forks are level before picking up or sitting down pallets to help reduce damage to products and equipment. 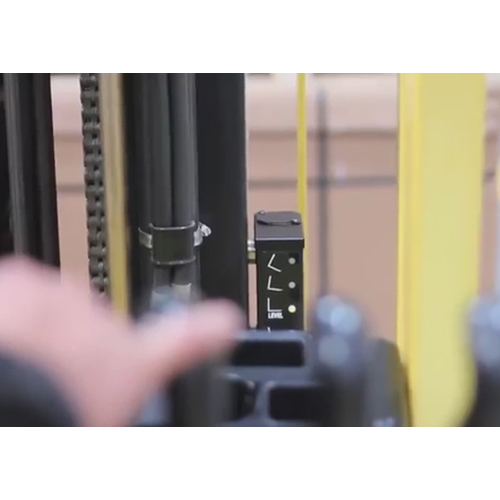 With the forks level, the risk of pallets being pushed or pulled off of a rack or stack of products and causing damage or injury to nearby workers is significantly lowered. Also, OSHA requires level forks when lifting people on a safety platform and the flat fork system ensures that the forks are truly level. Five flashing lights indicate to the driver if their forks are level or tilted at an upward or a downward angle, and to what extent the forks are angled. 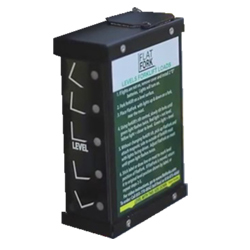 The flat fork unit is powered by two standard "D" alkaline batteries and can be calibrated to level and attached to the forklift mast in less than a minute by a single worker.